What is Li-Fraumeni Syndrome (LFS)? Genetics can’t be changed, but the way we approach our healthcare can be. Learn about a genetic condition that greatly increases the risk of cancer. LFS is a rare genetic disorder that greatly increases the risk of developing many types of cancer. Cancers related to this condition may occur at any age, but a characteristic feature of LFS is a high risk for cancer occurring in childhood. Approximately 40% of individuals with LFS will develop cancer in childhood. LFS affects both men and women and this condition has been identified in families all over the world. The types of cancers and ages of development do vary between LFS families. Review of the family history and information about the specific genetic alteration that has caused LFS may help doctors and genetic counselors provide more specific cancer risk information. LFS is caused by a mutation in the TP 53 tumor suppressor gene. When working properly, this gene controls cell growth, preventing cancers from forming. Individuals with LFS lack a properly functioning p53 gene. Most people with LFS inherited a mutation from a parent, but LFS can also result from a new mutation without having affected parents or a family history of cancer. A child of a parent with LFS has a 50% chance of inheriting the disorder. For this reason, LFS patients should discuss the significant reproductive implications with their doctors. 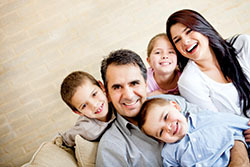 Determining if a person or family has LFS begins with taking a family history. Individuals with an adrenocortical carcinoma or choroid plexus carcinoma, as well as those meeting the criteria listed within, should be evaluated for LFS. A referral will often be made to a genetic counselor, a health care provider who specializes in diagnosing hereditary conditions, to provide families with an opportunity to discuss the implications of genetic testing. Genetic testing involves analyzing a sample of blood or saliva for alterations in the TP53 gene. Ideally, the process of genetic testing should begin with a family member who has had cancer. If an alteration causing LFS is identified, then other relatives should be tested to determine who else may be at risk. While the diagnosis of LFS can seem overwhelming, it is critical that patients be aware of the disorder so they may adequately manage their healthcare. Because patients with LFS often develop cancers earlier, regular check-ups and cancer screenings are extremely important – the sooner a cancer is diagnosed and treated, the better the chances of a successful treatment. Coordination with individual medical providers is also crucial to ensure that the LFS diagnosis is being considered in the treatment of conditions, particularly in regard to the use of radiation therapy in cancer treatment. Support for families and individuals with LFS may be found through the LFS Association (LFSA). LFSA provides a wide range of information, advocacy, and support services for those living with LFS. Additionally, they support the Life Consortium of researchers, medical providers, and caregivers. 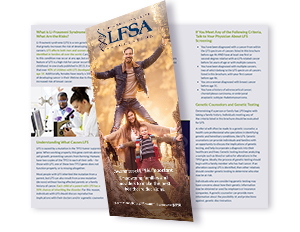 This unique partnership between the patient organization (LFSA) and medical consortium (LiFE) uniquely empowers the LFS community and facilitates our support for LFS families. The Li-Fraumeni Exploration (LiFE) Research Consortium is a group of dedicated physicians and scientists from around the world whose goal is to improve the lives of those with LFS. They have a tremendous interest in LFS and with their wide ranging expertise are advancing our knowledge of LFS through collaborative research and clinical trials. Find a list of research centers and clinical trials at LFSAssociation.org under the Medical Resources tab. This brochure has been made possible through an unrestricted grant from Myriad Genetic Laboratories, Inc. The information presented here is intended to provide general information for the LFS community. It is not intended to replace consultation with qualified medical professionals familiar with the conditions and considerations for each individual patient.